This appendix contains descriptions of the biomaterials associated with experiments in the main body of the report. It includes some basic biomaterial science including composite theory. It closes with descriptions of the research into artificial biomaterials, particularly cellulose and insect cuticle. This appendix contains a relatively brief overview of the biomaterials that compose the hooks in the experiments in the main body of the report. This is an essential component of the research into the mechanical properties of biological hooks, namely an understanding of the nature and properties of the biomaterials from which they are composed. For completeness, the first hook to be described (albeit briefly) here is the molecular hook. A hook at a nano-dimension is a molecular hook and an example of this is a chelate, a reactive benzene ring molecule that “hooks” an atom into its ring structure thereby rendering it inert by reducing its free energy level. Chelates operate within the bounds of molecular biology, associated with, amongst other things, a sense of smell. In this case hook is a verb since the organic molecule doesn’t look like a hook but it does hook a molecule via a chemical reaction. Clearly this is outside the realm of a study on the structure and mechanical properties of biological hooks; nonetheless I want to include mention of it here. This type of nanotechnology, creating new forms of molecules for different applications, needs to be differentiated from the self-assembly which is present in growing tissues. “Natural” self-assembly occurs within the bounds of natural environments and equally the environments exist for breaking down these assembled molecules through decomposition. This does not necessarily apply to artificially assembled molecules. More information on molecular hooks can be found in any advanced organic chemistry textbook. Further up the size scale, the hook starts to be hook-shaped in the sense of being a noun and structures become a combination of fundamental structures like cells and cellulose micro-fibrils. As the size of the specimen hook increases, we arrive at hooks such as teeth or fangs that are formed from a bioceramic, namely of tooth enamel and dentine. Other biomaterials may not form hook-shapes themselves but they may form the substrates to which hooks attach. Their study is important since it influences a hook’s performance. In the case of implants, for instance, the behaviour of the substrate material must be studied and understood since adverse reactions can affect the health of a patient (such as bone necrosis). Biological materials (which are composite materials) are usually not homogenous. The matrix/fibre composition can produce marked anisotropic behaviour. There may be trace elements present in the material to give localised performance enhancement such as Zinc in insect cuticle (from discussion with J F V Vincent) which increases surface hardening or there may be differences in fibre alignment that provides for directional differentiation of strength characteristics. Such fibre alignment differences can provide for increased strength in one direction but reduced tensile strength in another. As a consequence the structure is lighter and can provide support in the required direction but will not be able to do so in other directions. This should be a consideration for all attachment mechanisms that are derived from a biological parallel. If one is to copy a “hooking” design based upon its proven effectiveness in its ecological system then one should consider copying the salient performance features of the reciprocating substrate. In the case of burdock (see main body of report) the mechanism of hooking must be studied in order to note the dominant characteristics of the attachment action. Most of this section derives from “Structural Biomaterials” by J. F. V. Vincent [‎1]. This text was first printed in 1982 but it should be sufficient to provide the broad outline to this topic. There is no difference in essence between engineering and biomaterial definitions but those that have been derived and presented here from Prof Vincent’s text have a definite biomaterial orientation. The mechanical properties of a biological material have their origins at molecular level. Self-assembly is an area of study all of its own (See Benyus [‎3]). From the literature it is the process (or a portion of the process) by which biological materials grow. Molecules come together to form the required structures which develop into the forms and structures that make up the organism. Loading is directly onto the forces holding constituent atoms or molecules together. E.g. simple crystalline and ceramic materials that are typically very rigid, such as bone, shell, cellulose, cell walls of diatoms, crystalline parts of a silk thread and chitin of arthropod skeletons. which are familiar to an engineer as strain and stress. E = s/e is of course the Young’s modulus for direct stress, derived from the slope of the stress/strain curve. Where L0 and A0 are the initial length and area respectively and t is the shear stress. Where u is the Poisson ratio, normally assumed to be 0.5. This is not the case for soft tissues however, where a Poisson ration of 1 indicates that for a large extension of the order of 50% the extension dx is commensurate with a constriction dy. This is because the tissues consist of a fibrous mesh together with a jelly-like soft tissue which can flow and the narrowing due to the extension is much reduced. It would seem that this combination of meshes and soft tissue can give rise to unpredictable behaviour, especially if the fibrous mesh is considered to be like a mesh network with linked fibres. Most biological materials are viscoelastic to a greater or lesser extent. This means that they have a viscous component which introduces a new variable, time. It is defined as the ratio of shearing stress to velocity gradient (Newton’s Law). See Figure 1 and Figure 2. The mathematics for describing viscoelastic behaviour is described in detail in the text and shall not be reproduced here. But it should be added that these appear with the 3 standard types of test for studying the qualities of a viscoelastic material, namely a creep experiment, a stress-relaxation experiment and a dynamic experiment where a material is subjected to a cyclic stress. (see pages 15 – 25 of [‎1] for the descriptions of The Integral Model, The Differential Model and the Molecular Model). Biological materials and structures are renowned for their toughness and resistance to fracture. They behave differently when one comes from an engineering course dealing with metals. Biomaterials have a resistance to necking and yielding is not so well defined. Proteins are polymers of amino acids and polysaccharides are polymers of sugars. Proteins mainly exist in the form of fibres of collagen whereas polysaccharides are mainly space-filling. They make up nearly all the skeletal tissues, pliant and stiff, of animals and plants. The precise complement of amino acids or sugars and their sequential order along a chain ultimately controls the mechanical properties of the material from which they form. The function of polysaccharides is mainly to hold water in biomaterials. There is a distinctive difference between proteins and polysaccharides, since polysaccharides can be linked in many more ways than amino acids and can form branching polymers. Both groups of polymers behave in a manner dictated by the way the units or mers are bonded together and the way that they interact together, as neighbours in a polymer chain and as interacting lengths of polymer and it is this that dictates the reaction of the polymer to mechanical stress in a given environment. Mechanical tests to discover the nature of collagen do so by varying the conditions of temperature, humidity or chemistry around the bonds and seeing how the response to mechanical stress varies. Figures 4, 5 and 6 show the basic layout of the molecule. The central carbon atom is known as the a-carbon whilst R is a range of prosthetic groups including acidic hydrophilic, neutral, basic hydrophilic and hydrophobic. The polymer is a natural stable helical shape, the chains joined by hydrogen bonds. The text goes into the matter at some depth, including secondary structure, the shape of enzymes, helix breakers and more. (See pages 38-40 for more). Cellulose is a polysaccharide consisting of thousands of monosaccharide sugar molecules called b-d-glucose. Carbohydrates such as monosaccharide sugar are a group of inorganic compounds containing the elements carbon, hydrogen and oxygen in the general ratio of 1:2:1. Complex polysaccharides are composed of building blocks of monosaccharides. b-d-glucose is a monosaccharide which is defined as the least complex of the carbohydrates. In other words a monosaccharide cannot be broken down into simpler carbohydrates by hydrolysis, the breakdown of organic materials through the use of water. b-d-glucose is hexose (6-carbon) sugar which has a ring structure. The ring structure is formed when the C1 and C6 carbons come within close proximity of each other and an oxygen bridge forms, resulting in a hydroxyl group forming on the carbon 1. Figure 7 – to come. Figure 8 – to come. Polysaccharides are complex molecules of high molecular weight composed of a large number of repeated monosaccharides (monomers) joined through glycosidic linkages i.e. the hydroxyl molecule of adjoining rings react with the release of H2O to form an oxygen bridge. Cellulose is a polysaccharide of glucose molecules. Figure 9 – to come. Cellulose is a straight chain polymeric molecule of high molecular weight joined by b-1,4 links. It is a fundamental component of the cell wall and the most abundant natural product in the world. In new cells the wall has approximately 20% cellulose but as the cell matures and new wall material is deposited to form secondary walls, the cell wall becomes impregnated with non-carbohydrate materials such as lignin, suberin or cutin. Cellulose comprises about 43% of the secondary wall. Since this is fundamentally a research project into biomimetics it is appropriate to include a brief discussion on the possibility of artificially synthesizing a material with biological properties. There are two common plant polysaccharides, cellulose and starch. Starch has been successfully produced artificially but it is not a structural material. As yet, cellulose has not. The bacterium Acetobacter acetigenum is a cellulose producing bacteria that is studied most, although according to the literature relatively little is known about the metabolism of cellulose. When radio-active labelled 14C glucose is fed to the bacterium cultures the carbon can eventually be found in cellulose produced by the bacterium. Figure 10 – to come. In other words, it requires extracts from naturally occurring organisms to synthesize this natural biomaterial in a bioreactor. Further, in order to “grow” a structural material, artificial stimuli have to be simulated to obtain the natural response which gives rise to the correct material structure and properties. This means a study of the system, the functional ecology, is necessary since it is the system interactions that influence the strength of the tissue during growth. For example, the burdock hook (Arctium minus) used in Experiment 3 develops as a pointed bract with a scleretised tip on the seedpod of the flower which bends into its hook-shape through the seasonal desiccation of the flower. The burdock bracts lie upwards against the pod in an encircling rosette at the base of the pod just above the stem. Their tips all bend away from the seed pod and it is hypothesised that this is because it is the outer surface of the bract that is exposed to the environment. The outer surface loses moisture whereas the inner surface retains its moisture content and there could be an uneven deposition of cellulose microfibrils which causes this bending. This results in an uneven tensile pressure in the plant cells and the resultant bending like a bi-metallic strip to form a hook. At this stage it is not possible to artificially manufacture the structural material cellulose. It is known that some studies of organic fibres occur in the Materials Department and it is a consideration that this form of attachment mechanism could be paired with material manufacture in some way. Keratins form a group of varied proteins which contain significant amounts of sulphur cross-linking and stabilizing in the material. It is found in horn, hair, hoof, feather, skin, claws etc. The types of keratin include mammalian, avian and others such as reptilian. In skin and “basement” membrane it is a reinforcing fibre. In tendon and muscle it transmits tensile stresses (most studied in the form of a rat tail). In a mouse, 20% of all protein is collagen – see table below from page 53 . Amino acid composition – hydroxyproline which is praline hydroxilated after its incorporation into the peptide chain, is often used on its own for estimating collagen content of tissues. Plant cells, cartilage and other structures of similar biomaterials are able to withstand compressive stresses by redirecting the stresses through a liquid interface to structures that are able to withstand tensile forces. To illustrate, compressive stress applied to a plant cell increases the turgor pressure within the cell and this is absorbed by the plant cell wall going into a state of tension because hydrostatic forces redirect the compressive loading outwards. These types of composite materials consist of strands of material with high tensile modulus suspended in a matrix of softer, binding material. The next order of stronger biomaterials consists of materials that have a stronger matrix material that is better able to withstand the shear stresses induced by compressive loading, that are able to maintain a molecular lattice structure in the matrix material. The numerical analysis of the bio-composites is identical to that of artificial composites, consisting of straight forward volume fraction analysis converted into a form that utilizes Young’s and Shear moduli. These can be found in any engineering text on the mechanical properties of composites such as glass fibre or carbon fibre. Of prime interest to an engineer is the particular properties of biocomposites that give it a higher strength-to-weight ratio than conventional artificial composites. There are two types of natural resistance to crack propagation. The first is described by a model called the “Cook-Gordon” model for the blunting of a crack tip at a weak interface [Figure 12]. Figure 12 shows two aspects of the Cook-Gordon model. It is a description for a model that avoids brittle failure associated with stress concentrations and concerns composite materials with weak matrix-fibre interfaces. First there is the advance of a crack with a rounded tip. This occurs in materials that are able to withstand high strains. For instance, glass cannot but rubber can withstand high strains. In terms of chemical bonds, the rounded tip redistributes the separating stress away a few chemical bonds and shares it amongst many. Secondly, in advance of the crack tip a second stress in induced. This stress operates in a plane that is perpendicular to the crack and it is a tensile stress; the material in advance of the crack tip is being pulled apart. 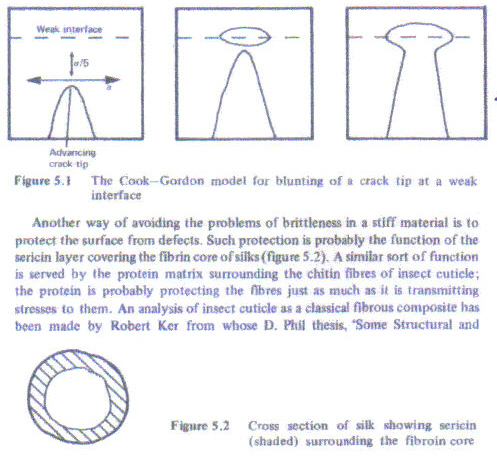 Where this secondary tensile stress encounters a weakness such as at the matrix/fibre interface (Figure 12 – The Cook-Gordon model for crack blunting from Vincent [‎1]) this leads to separation between the materials, producing a bubble which the crack advances to meet and a blunt, strain absorbing tip is the result. Throughout this mechanism, strain energy is being absorbed which slows crack propagation. At first, the intentional introduction of an apparent weakness into a material design may seem to indicate a disadvantage, however this phenomenon can be occur in a material to its advantage if the dispersal of the matrix and fibres lends itself to this mechanism in a manner of preventing complete failure. The second mechanism is the coating of a relatively brittle material to protect the surface from stress concentrating defects, for instance in spider’s silk where a protein matrix surrounds the chitin fibres of insect cuticle. 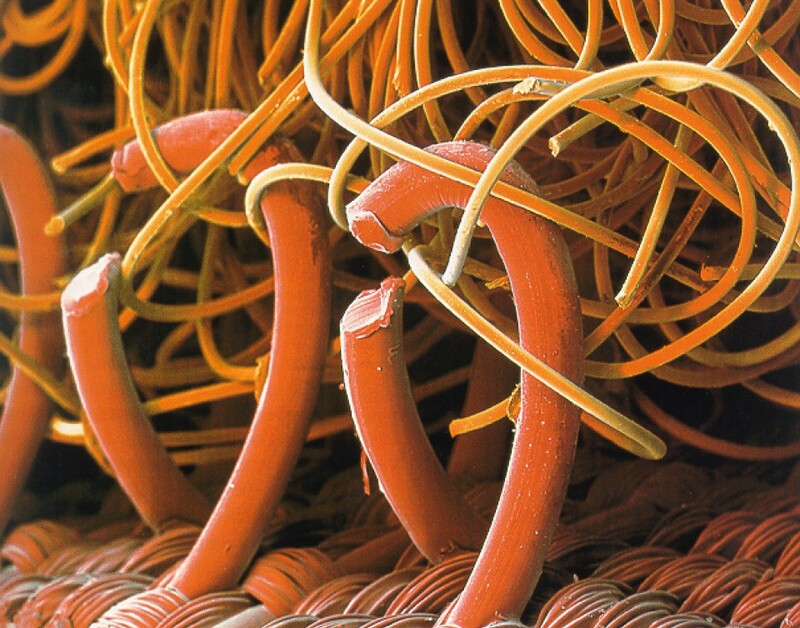 Insect cuticle is composed of a fibrous network of chitin microfibrils surrounded by a matrix of protein. It is suggested that the matrix fibre interface is well bonded, compared to that of artificial glass-fibre resin. In the text, the tendon of a locust hind leg was tested in tension = to fracture (see Figure 14 – Brittle fracture of the hind leg of a locust. This figure is given to indicate that the fracture occurs through distortion of the matrix and not through slip at the fibre/matrix interface since there is no evidence of fibre pullout: as one fibre fractures the fracture plane continues across the section to the next fibre. Youngs modulus for the locust tendon is given as 11 GNm-2 and the transverse modulus as 0.15 GNm-2. The volume fraction of chitin is given as 17% and the difference between the two moduli is explained as being due to the high degree of chitin microfibril orientation. Figure 15 – Limiting cases for the behaviour of composites shows a model for composite behaviour when a composite is stressed on different directions. Diagram B can be compared with the locust tendon being stressed in the transverse direction. 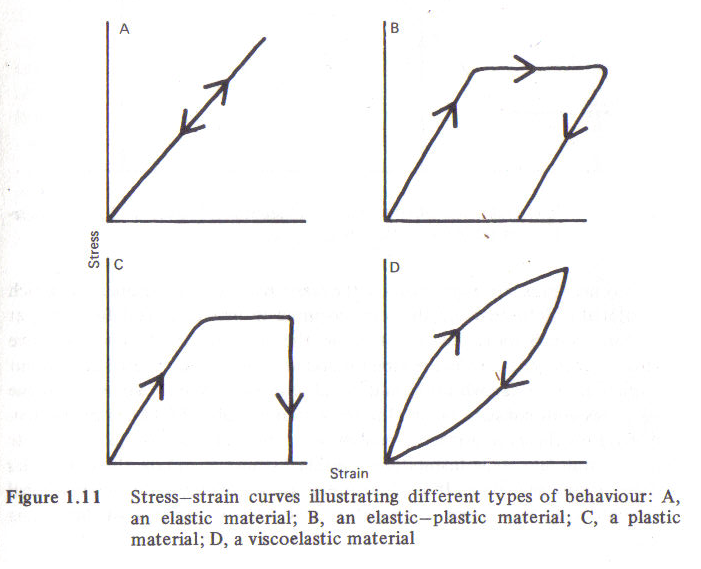 The weaker matrix has an increased strain giving rise to a lower Youngs’ modulus for the composite than when stressed in a longitudinal direction, when the stronger microfibrils absorb most of the stress. Where Vf(z) is a function to describe the volume fraction of fibres. The Young’s modulus for chitin compares well with that for cellulose and this is utilised in the next section on the preparation of an artificial insect cuticle (see ‎3). This description of insect cuticle from Vincent proceeds with how the behaviour of cuticle is affected by fibril length and how it behaves in compression and buckling. As the fibril lengths decrease so the impact of the matrix on the strength of the material increases. The general equation for Ec implies that the fibrils run the length of the test material. In fact in biomaterials this is rarely the case. There are two theories on how the protein matrix of insect cuticle stiffens. The first, by Pryor who worked with the egg case of the cockroach, suggests that it is through the activity of quinines the proteins are cross-linked with covalent bonds. But Fraenkel and Rudall propose a different theory, having noted that the process of tanning of cuticle includes dehydration while working upon the cuticle of fly larvae. The difference between the two cases is that the cockroach egg case does not contain chitin whereas the fly larva does. It is stated in Vincent that the detection of evidence of cross-linking is difficult. He cites only resilin as the cuticle in which the presence of cross-linking has been shown. So it is difficult to prove that Pryor’s process occurs. A hydrophobocity index is used for materials to indicate stiffness, a measure of the ability to remove water. As water is removed the stiffer the material becomes and so the higher the index, the stiffer the material becomes. It is suggested that water is important in controlling the matrix properties of insect cuticle just as it is important with collagens and keratins. There is more in the text with regards to other properties of insect cuticle including hardness. It seems inappropriate to include more detail here. “Some structural and mechanical properties of locust and beetle cuticle” by R Ker. The abstract describes this as a model system of tanning of a protein matrix within a fibrous structure such as commonly found in insect cuticle but using the cellulose of paper instead of chitin. The paper acts as a scaffold for the tanning molecules. It states that “there are many extracellular materials produced by invertebrate animals. Examples are insect cuticle, mussel byssus threads, periostracum of mollusks and tubes and parts of tubes of various marine worms. The process involved treating the paper by impregnating it with a tripeptide or protein plus catechol, then treating it with tyrosinase to oxidize the catechol. The resulting material was found to be waterproof and of very high strength. The experiment was conducted to explore the possibility of using paper as a framework for depositing protein and tanning it, developing it into a model system for catechol tanning in general. Various tanning agents were used including catechol, phenol and tyrosine.